There is always some kind of initiation process when entering someone’s family through marriage. For my future in-laws, part of this obstacle is how well one can execute a home cooked meal. (insert side-eye here..lol) I completed the said challenge by attempting to woo them with my famous mixed green salad with homemade salad dressing and a simple Spinach Tagliatelle pasta with Shrimp and tomatoes in a white wine butter sauce. Sounds good, right? Hot in the Pan... Tagliatelle with Shrimp and Tomatoes in a White Wine Butter Sauce. Anywho, I thought I'd share my recipe because most of us, at one point or another, face a point when we need a go-to dish for special company. It's not too fancy to make make people think you are booshie , yet it is just refined enough to impress. It’s budget friendly, it’s yummy and there’s enough to feed everyone and still have leftovers. 1. Cook Pasta to al dente per instruction. 2. Season defrosted Shrimp with Salt and pepper. 3. Add 2 Tbs butter and oil to a sauté pan. Once hot add onion, garlic and red pepper flakes, sauté over medium heat until onions are translucent and mix is fragrant. 4. Add the shrimp to the hot pan and cook. 5. Add the rest of the butter. 6. Once Shrimp is almost done add wine and cook down just a little. 7. Add stock and turn the heat down to prevent over cooking the shrimp. 8. Add tomatoes and allow to cook slightly. 9. 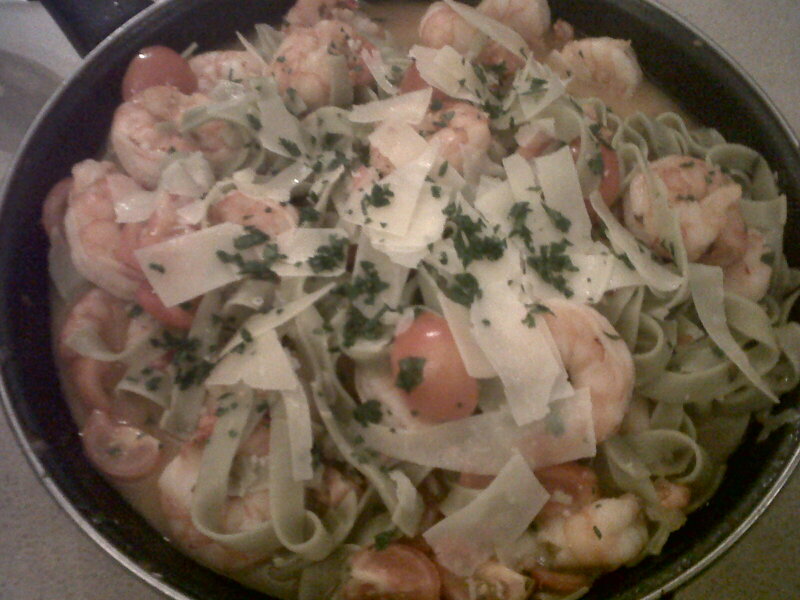 Toss the Pasta in the pan with Shrimp and sauce. 10. Adjust seasoning if necessary. ﻿Find the printable recipe here. Hope you all enjoy this yummy go-to dish! Have a great weekend! See you back here on Friday, for “What’s for Dinner? ?”.